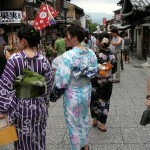 Long day today (7am to 9pm) exploring Kyoto, the ancient capital of Japan. For more than a thousand years (794-1868), this wonderful city was the seat of the Imperial court, home to high culture, scandal, spectacular art and festivals, atrocious civil wars and constant intrigue. We chartered a bus to help the students see as much as possible, and today were joined by some Japanese students from the homestay families. Leaving Okazaki, we headed west, through the Sekigahara pass, and after a brief stop at Taga in Shiga Prefecture, arrived in Kyoto. Kinkaku, or more precisely, the shariden at Rokuon-ji, more popularly known as Kinkaku-ji. 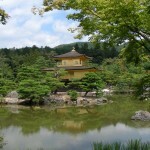 Our first destination was Rokuon-ji, better known by the moniker “Kinkaku-ji”. 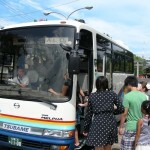 One of the most popular tourist destinations in the entire country, this was the first time in this program that the students had encountered large crowds (good practice for Tokyo). The weather was perfect, so most of the students were able to get some pretty good photos. 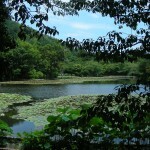 we began with the view of the shariden, which reflected well in the still waters of the pond. The pond itself is interesting, based on an ancient Chinese design, but was difficult to enjoy due to the crowds, despite it being a weekday. The reflection in the pond of the gold leaf covered pavilion was beautiful, but we were also able to see the karesansui garden and the “land ship” behind the Abbot’s quarters. The waves of the sea. Abbot’s quarters. Getting from one place to another could be tricky at times though, as there were so many tourists, but we managed to see all the key parts of the temple. As we moved towards the less “touristy” parts of the site, it became possible to give more detailed explanations. There is a hell of lot to see here, and most visitors (including Japanese visitors) miss most of the interesting things to see. 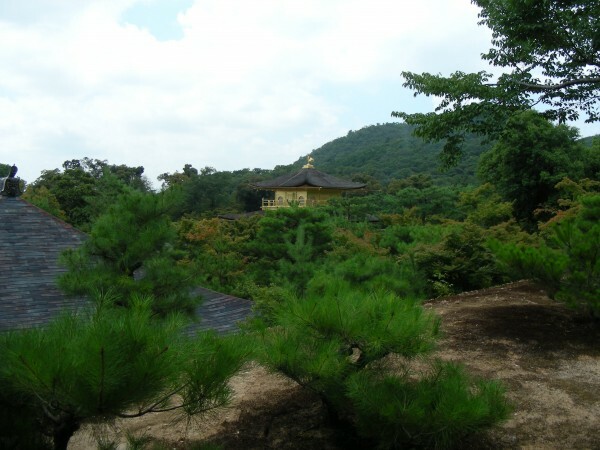 We had plenty of room and reasonable privacy for the karensansui garden behind the Abbot’s quarters depicting the waves of the sea, the fantastic “land ship”, and the view line from Sekkatei. Throughout the tour, we were constantly being joined by eavesdropping foreign tourists, which was a bit bemusing at times. Though not a problem as such. 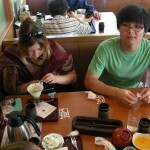 The more visitors can learn about Japan the more the merrier. 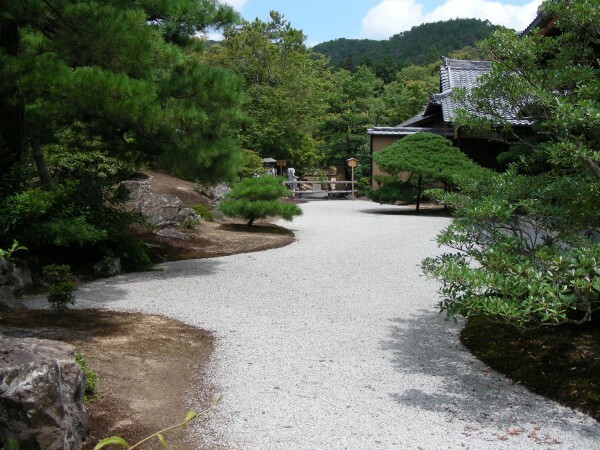 Built in the late 14th century as a villa called Kitayama-dai, during the long period of civil (Onin) war it eventually became a Zen temple. 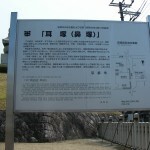 During the Onin war, all of the buildings in the complex aside from the pavilion were burned down. As with most of Kyoto. 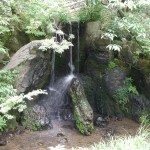 Carp (it is a stone) leaping up the waterfall. Kyoto (the city) was not bombed during WWII (other parts of Kyoto Prefecture, which stretches across to the Sea of Japan were). 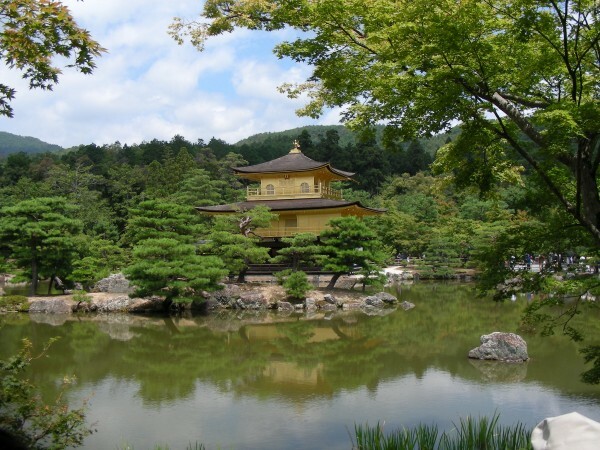 However the shariden of Kinkaku-ji was destroyed again on July 2, 1950, around 2:30 am. This time the pavilion was burned down by a 22-year-old novice monk, Hayashi Yoken, who then attempted suicide on the Daimon-ji hill behind the building. 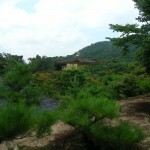 The view line across Kinkaku from the Sekkatei tea house. It looks natural, but this is anything but natural. Best horticulturalists in the world. Hayashi survived, and was subsequently taken into custody. The monk was sentenced to seven years in prison, but was released because of mental illnesses (persecution complex and schizophrenia) on September 29, 1955; he died of tuberculosis shortly after in 1956. During the contagion, the original statue of Ashikaga Yoshimitsu was lost to the fire. What we (can sometimes) see now is a restoration. A fictionalized version of these events is at the center of Yukio Mishima’s 1956 book “The Temple of the Golden Pavilion”. 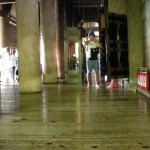 We were able to get a good view of the layers of borrowed scenery and also the inside of the famous Sekkatei tea house. The rustic wooden “Nandin” post inside the tea house is amazing. It is rare to see a piece of nandin of this size, so despite the wabi-sabi aesthetics involved in the overall design of Sekkatei, this is basically an act of ostentation. Add the view line and borrowed scenery into the mix, and you wonder whether it was vanity, a desire to impress, or a need to intimidate. Despite the crowds, we managed to stay on schedule and more or less on time. 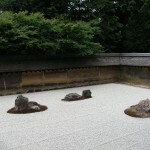 Next on the schedule, was nearby Ryoan-ji. 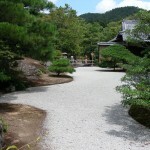 Part of the karesansui garden. The wall, foliage and borrowed scenery are key components. With it’s superstar rock garden, moss gardens and pond, Ryoan-ji was also fairly crowded, though not as much as the previous destination. Perhaps many of the tourists had already headed off to lunch (?). 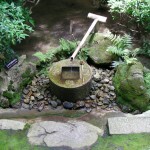 Model of the garden with tenji explanations. For sight impaired visitors. We were again frequently joined by other visitors, but it didn’t cause any problems. 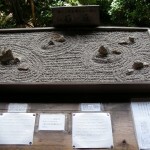 There is a model of the garden just inside the entrance, so that visually impaired visitors can understand the layout. It was also a good opportunity for our students to learn a little bit about tenji – Japanese braille. Not all highly educated, intelligent, native speakers of Japanese, can read all of the Kanji in common use. Remember that. Next year’s program will probably also include a brief introduction to Japanese sign language. Still working on that. 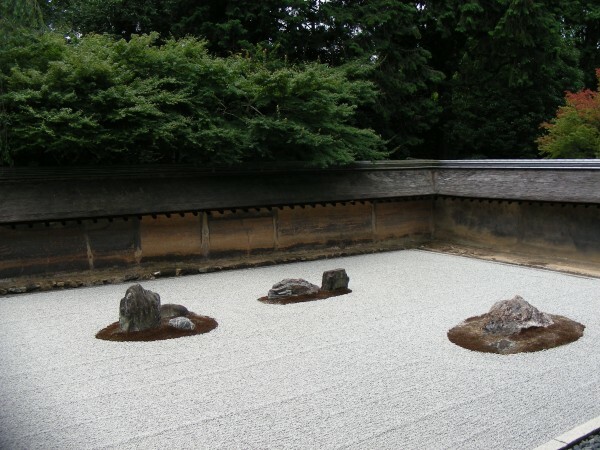 The main part of the garden itself consists of 15 rocks, carefully placed so that no matter where visitors or monks sit, only 14 are visible. The idea is aid in meditation. Achieve enlightenment, and you can visualize all 15. It makes extensive use of borrowed scenery, and the oil stained retaining wall. The foliage just beyond the wall is constantly changing with the seasons, and as the garden is raked each morning, it is always different every day. No one really knows who built it, or even why. 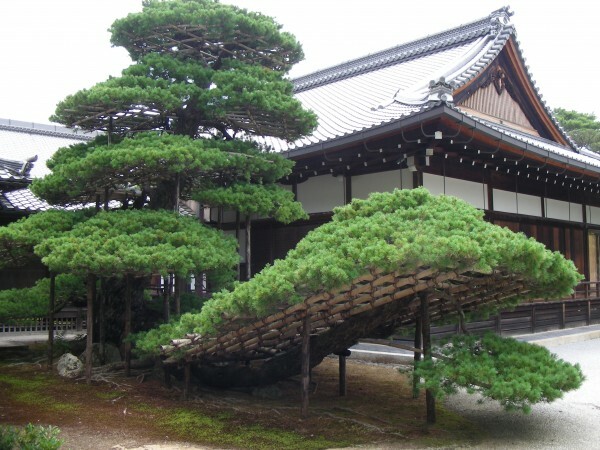 As Gunter Nitschke wrote: “The garden at Ryōan-ji does not symbolize anything, or more precisely, to avoid any misunderstanding, the garden of Ryōan-ji does not symbolize, nor does it have the value of reproducing a natural beauty that one can find in the real or mythical world. I consider it to be an abstract composition of “natural” objects in space, a composition whose function is to incite meditation”. 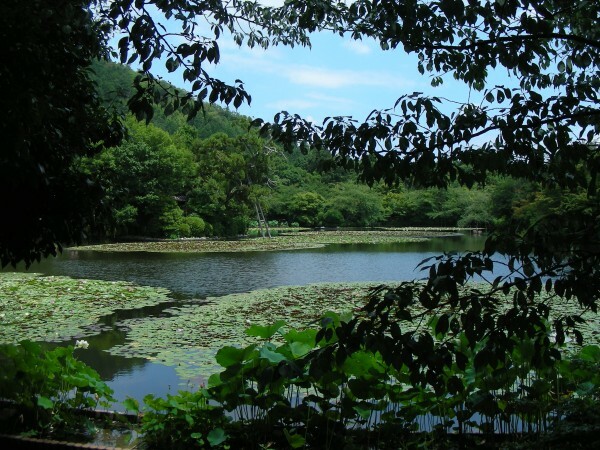 The large pond predates the founding of the temple by several centuries. Probably built by Fujiwara Saneyoshi in the 11th century. 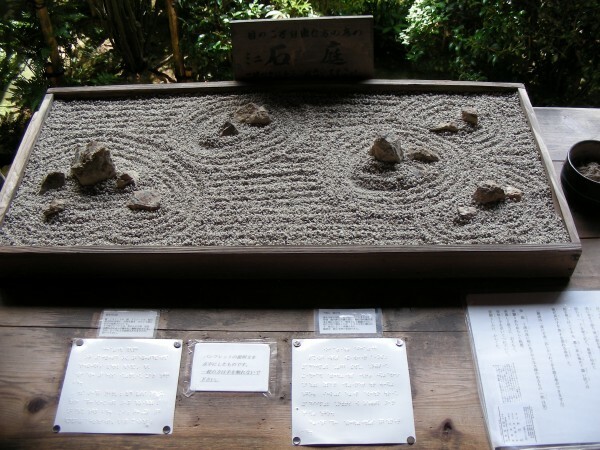 “What’s so special about the garden at Ryoanji?” I asked him, naming the famous rock and sand garden in Kyoto’s most brochured and pamphleted Zen temple. “The spaces between the rocks,” he replied, with his mouth full of toothpaste. Perhaps the best part of the garden is actually on the other side of the hall, the tea garden. Most people walk past it, either not noticing it at all (they have shopping to do and a bus to catch), or not knowing it’s significance. A key part of this though is the tsukubai. 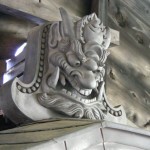 Replica of the Tsukubai. Original is about 8 meters away. Have a close look at it. 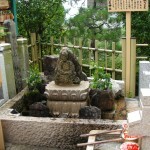 It is a small stone basin near the tea house (which you can rarely visit). The square in the middle is the important bit. The 4 kanji characters surrounding the square are 五, 隹, 止, 矢 (five, old bird, stop, arrow) and when read individually, are meaningless. Now imagine that the square is a kanji radical, and part of each of the 4 characters. 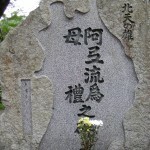 The kanji transform to 吾, 唯, 足, 知. A chant meaning “I know only satisfaction”, “I have all that I need”. The tsukubai is round, as was the coinage of the day, not a bad way for a Zen temple to express anti-materialism or remind monks of their vows. 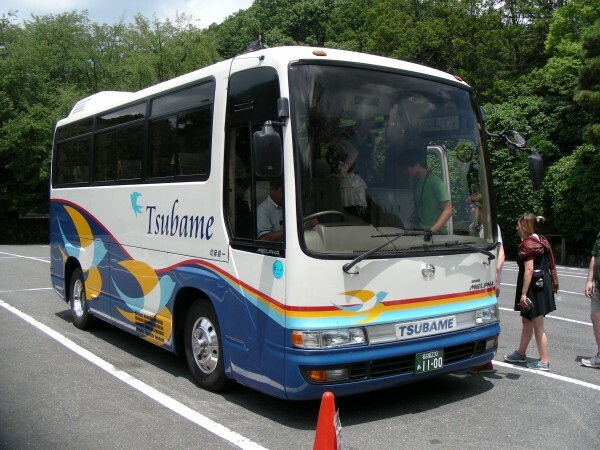 The other thing about the tsukubai that you should think about, is that it isn’t the original. What you can see is a replica. 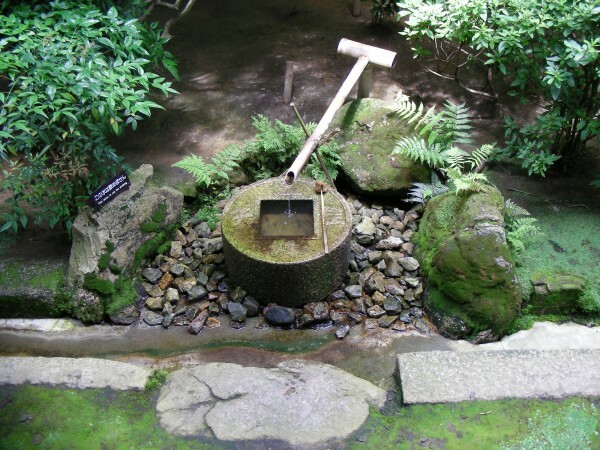 The original is about 8 meters away, next to the tea house of course, concealed from view by a camellia bush reportedly planted by Toyotomi Hideyoshi himself. Without the replica, visitors would probably more than happily stomp through the tea garden for a selfie. 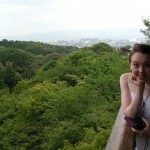 From Ryoan-ji we headed to lunch, at a restaurant across the road from the beautiful Hirano Jinja. 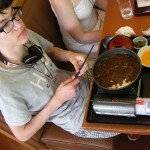 Lunch was great, with the students enjoying a wide ranging menu and, in particular, their desserts. The big lunch. Students & host family members. Discovering the dessert menu. Though the main attraction may have been air-conditioning. Sukiyaki (in summer??). Apparently was pretty good. In the meantime, our hard working driver ate a bento. Will fix this problem. Sakura trees in Hirano Jinja. 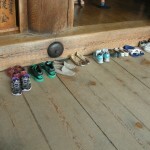 They then had the opportunity to explore the shrine at their own pace. 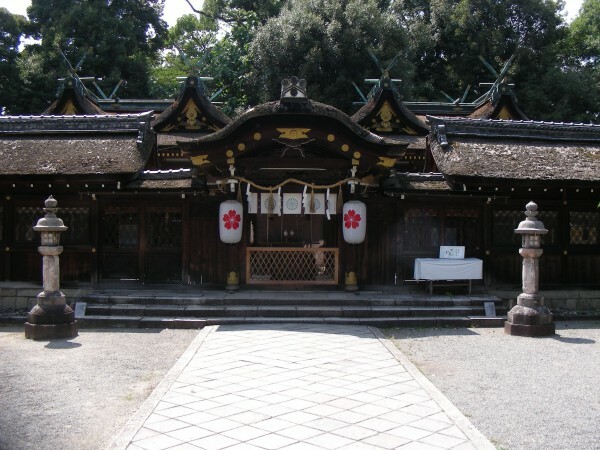 Hirano Jinja is as old as Kyoto itself. 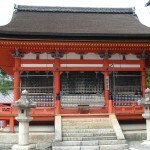 The shrine was moved to Kyoto from Nara when the capital was transferred in the year 794. The capital was moved primarily due to constant interference by an increasingly powerful clergy. 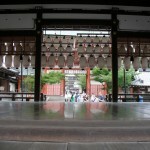 By the middle of the Heian period, the shrine was considered extremely prestigious, outranked only by the Matsuo, Iwashimizu-hachimangu, Kamigamo/Shimogamo shrines, and of the Grand Shrines of Ise. These days, what it is really famous for (apart from being a nice place for high school students to walk off some of their summer lunch) is cherry blossoms. Especially around nightfall, this is the place to be in spring. There are about 400 sakura in total, but about 50 different species in total, each dating back to donations made by different court nobles. As a result, the cherry blossom viewing season here is about 4 weeks long. 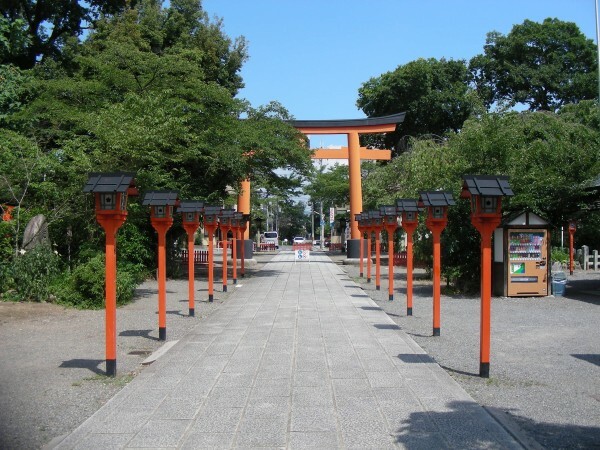 The main sanctuaries are built in the Kasaga-zukuri style (Nara), and the torii gate located where we entered the shrine was donated in 1651 (from the nearby Imperial Palace). 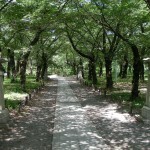 It is a surprisingly peaceful place during the middle of the day. We normally have the place to ourselves. 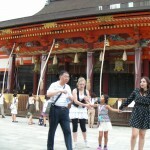 It is a good opportunity to explain not only the architecture and history, but also the local customs. 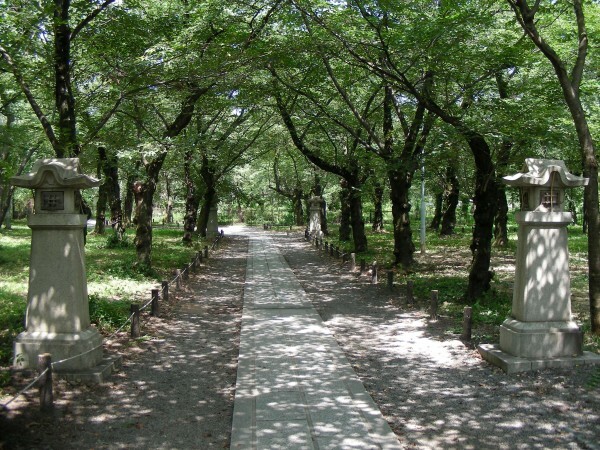 There are also some enormous gingko trees (a shinto shrine is usually a good bet if you need some shade on a hot summer’s day), and a lot of small details that are interesting to explore, especially without crowds. From Hirano we headed across town to the Mimizuka. 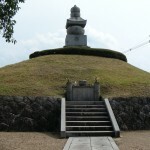 This burial mound is a legacy of the two invasions of Korea made by Toyotomi Hideyoshi in the late 16th century. Most Japanese people don’t know about it or it’s gruesome origins. 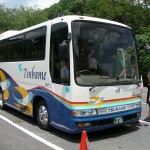 The only other visitors were some Korean students on a school bus from a school based in Wakayama. 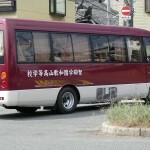 The mimizuka. Just down the road from the Toyotomi shrine. Back on the bus. Toyotomi shrine in background. 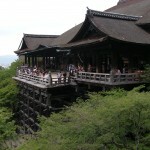 Next destination, the famous Kiyomizudera. Located on the hills on the east side, from some areas of the temple you can look down onto the city center. It is undergoing extensive restorations, but there is still a lot to see and the forest is beautiful. 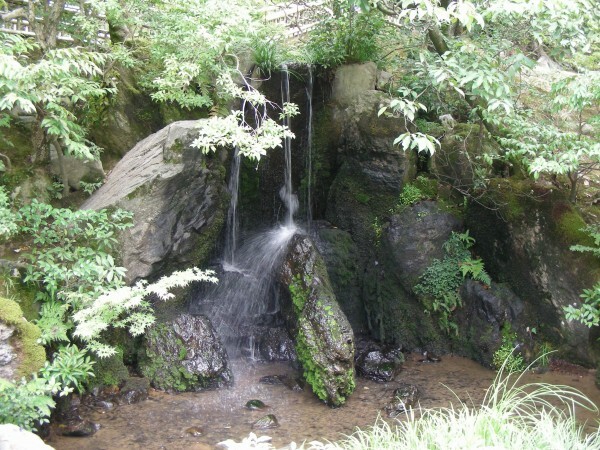 Established in the late 8th century after a shogun hunting deer to provide blood to his pregnant wife (it was a tradition at the time), discovered a hermit living/meditating near the pure waters of the Otowa spring. 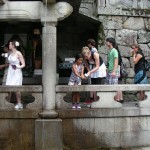 Visitors believe that drinking the water brings good fortune. The buildings are beautiful, constructed entirely of wood, but no nails are used in the process. 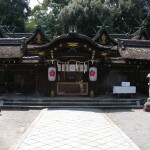 Tamura-do　（田村堂）. The founder’s hall. Kyoto station and tower in background. At the main hall. Shoes pointing every which way 🙁 Again. View of the Butai. Not a single nail. 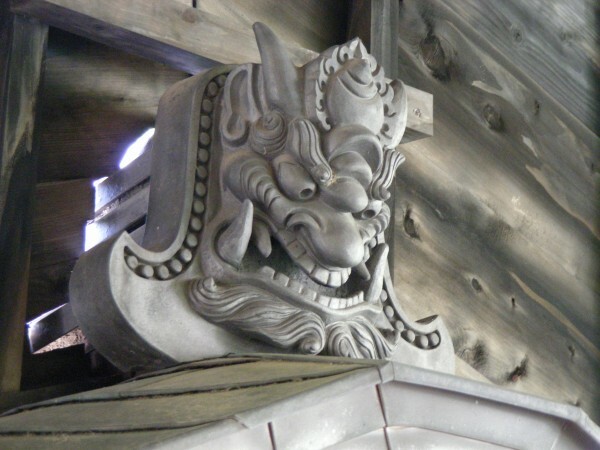 The most important (and most ignored) monument in Kiyomizudera. 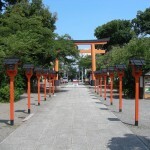 One of the sites popular with the students was the Jishu Shrine, located next to the main hall. The deity enshrined here is supposed to help with love and relationships, and you always see visitors trying to walk from one love stone to the other. If you can do it with your eyes closed, you will find your love unassisted. If you need someone to tell you whether to move a little left or right, then you will require introductions and assistance. 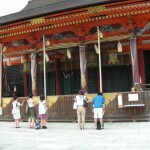 Another popular site was the shrine of Okage-Myojin. 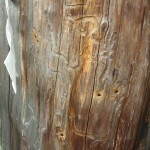 The cedar trees behind the shrine are covered in nail marks (which possibly killed the trees). 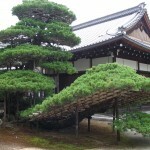 What happened was that when two women were hoping to marry, and found that they had a rival for the would be husband’s affections, they would then make a straw doll of their rival, sneak in during the middle of the night (a Ushinotoki-maiiri) and nail it into the back of the tree. When the rival came to ask the deity for support, their prayers would backfire and become a curse. From Kiyomizudera we walked via Ninenzaka and Sannenzaka to Yasaka Jinja. These two, small, steep streets are sometimes narrower than lane ways. 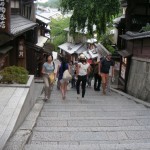 They are lined with small shops, cafes and ryokan. Good for souvenir hunting. After reaching the bottom of the hill, we cut across to Yasaka Jinja via tiny laneways, some （石堀小路） less than the width of outspread arms. Descending Sannenzaka. A beautiful street. 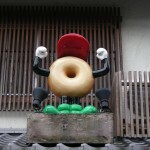 The soy milk donut (and ice cream) shop. 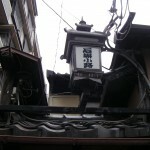 石堀小路　A street just over a meter wide. After walking past the cafe where Charlie Chaplin, Prince Charles and other visitors would rest and recover, we entered Yasaka Jinja. This shrine is located at the end of Shijo (4th street), and is the most important shrine during the Gion festival held each summer. 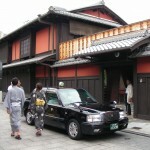 Popularly known as “Gion San”, it is ancient. Visitors come to pray for protection from illness, recovery from illnesses suffered by relatives and friends, amongst other wishes. In Yasuka Jinja, with a child from a host family. Customers arriving at the exclusive Ichiriki Ochaya. We ended the day with some free time for shopping and sightseeing in Gion. 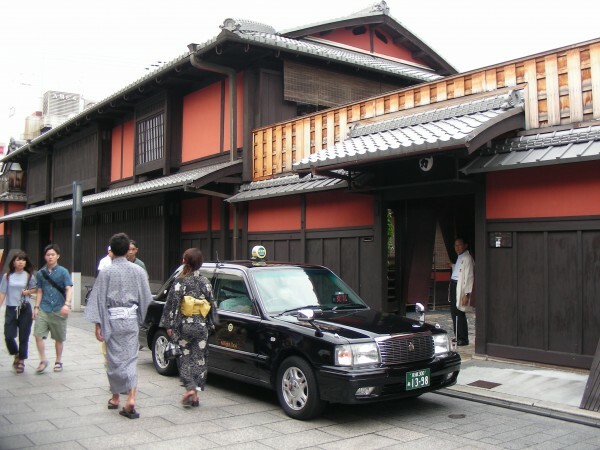 The Ichiriki Ochaya is a great place for Geiko and Maiko spotting, and the main street through the heart of Gion has many specialty shops that are good for souvenir hunting. 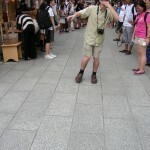 There wasn’t enough time today to cross the river to Pontocho and Kawaramachi. Maybe next year. 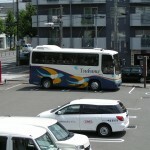 We then headed back through Yasaka Jinja to our waiting bus, and returning home to Aichi. 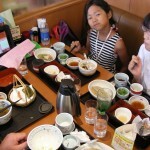 Dinner was at Tsuchiyama in Shiga prefecture. We arrived tired but happy about 30 minutes ahead of schedule, and transferred the students back to their homestays.